Directed by Lucy Seymour, with David Hazeldine as Music Director. The Lerner & Loewe legendary classic MY FAIR LADY. 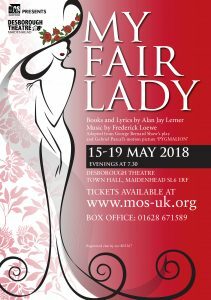 Performed at The Desborough, Maidenhead Town Hall, from 15th to the 19th May 2018. If anyone is interested in the above please contact us – another audition date will be announced shortly. All the above at Taplow Village Hall. In the flush of his first success, Higgins puts Eliza to a preliminary test. He will introduce her to his mother’s snobbish guests at the Ascot Race Meeting the following week. Eliza expresses her own towering exaltation in “I Could Have Danced All Night.” Eliza, strikingly pretty in her new gown and hairdo, appears at the races (“Ascot Gavotte”). Instructed to restrict her conversation to the weather and everyone’s health, she says her little set pieces flawlessly. The illusion is shattered when her enthusiasm for the horse she is backing impels her to indulge in a bout of violently unladylike cheering. Freddy Eynsford-Hill falls hopelessly in love with the new Eliza, and later pours out “On the Street Where You Live” at her window. Six weeks later, Higgins – in a crucial test – presents Eliza at a full-dress Embassy ball. She is the object of admiration, and everyone speculates on her identity. It becomes obvious that Eliza must charm Karpathy, a European phonetics expert. At the height of the ball, Karpathy invites her to dance and comments on the pureness of her English. Pickering and Higgins, back at the flat, indulge in self congratulation (“You Did It”). Neither of them takes into account Eliza’s personal accomplishment in the matter. Eliza has absorbed the sophistication and the courage to see the unfairness of this, and she blows up, demanding recognition. The Professor is not so much affronted as astonished; it is as though a statue had come to life and spoken. Infuriated and frustrated, Eliza storms out of the house. She encounters Freddy and turns her fury on him (“Show Me”). Eliza aimlessly walks the streets of the town the remainder of the night. She encounters her father, drunk and dressed for a fashionable wedding. He has become wealthy, and Eliza’s mother is marrying him at last (“Get Me to the Church on Time”). Higgins discovers that he is hurt because Eliza left him. He meets her at his mother’s flat where she has gone for advice. They argue violently (“Without You”) and she storms out. It is only a moment after her departure that Higgins finally wakes up to the fact that Eliza has become an entirely independent and admirable human being. He realizes that he will have a difficult time getting on without her (“I’ve Grown Accustomed to Her Face”).